Based on 3479 customer ratings. For the number one PIZZA DELIVERY IN ORLANDO and best authentic Chicago stuffed pizza check out Giordano’s in Lake Buena Vista, FL. Giordano’s is located right around the corner from Universal Studios, SeaWorld, and Orlando Premium Outlets, so you can indulge in the best pizza no matter where you are! Visiting or Living in Orlando? 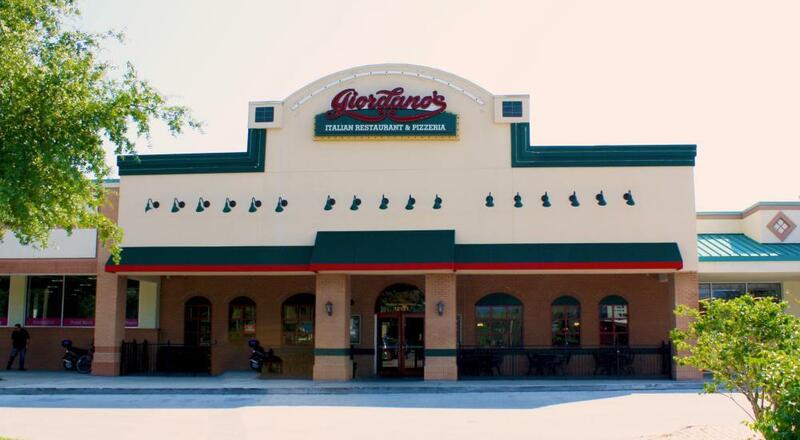 Giordano’s Lake Buena Vista location is right in the heart of some of Orlando’s best attractions. Here, you’ll find amazing bargains at Lake Buena Vista Factory Stores, as well as great golfing at Congo Rover Golf. Nearby Kissimmee has water sports and boat tours to try. Cirque Du Soleil performances are nearby if you’re looking for something different. Looking at all those world-class attractions can work up a world-class hunger, and what better way to satisfy that than with the best Chicago-style pizza and food? Don’t be fooled: You can enjoy all the sunshine of Orlando and still get the real Chicago taste of authentic Italian-Chicago deep-dish pizza pie – without having to battle snow and ice. Giordano’s in Lake Buena Vista is the answer. Eat in and enjoy our delicious artisan-made pizza and other mouthwatering dishes. Relax for a while. After a day in the hot Orlando sun, enjoy some cool drinks with us. You’ll be fueled for your next Florida adventure. You can also order out. We deliver to your Orlando home or hotel room. You can even get takeout and make a picnic of it. No matter what, you get that unmistakably scrumptious Giordano’s taste, with zesty tomato sauce and the flavorful experience of fresh, hand-selected ingredients. The Giordano’s difference is clear in every bite. We carefully source our ingredients to bring you the freshest and best of every flavor. Our pizza is based on an authentic Old World Italian recipe, so you can taste the Mediterranean in every bite. Our artisans carefully craft every pizza for absolute perfection. With Giordano’s, amazing flavor is always on your plate. We pride ourselves in our delectable appetizers, hand-crafted Chicago stuffed pizzas and sensational desserts that will keep your family smiling for days to come. Nothing brings your family together more than a great meal, and we are the destination if you are looking for flaky crust, creamy mozzarella, and tasty marinara sauce all served on our amazing Chicago stuffed pizza. Staying in one of the many famous Walt Disney World Resorts? We got you covered! Giordano’s offers PIZZA DELIVERY IN ORLANDO to all of the major resorts. You don’t have to sacrifice quality when it’s late, because Giordano’s delivery service is available when you need it. Satisfy your late night cravings after a long day at the attractions by giving us a call so we can deliver dinner directly to your door. THIS LOCATION IS CONVENIENT TO: Universal Studios®, SeaWorld ® Orlando, Disney's Hollywood Studios™, Orlando Premium Outlets® - International Dr., Arnold Palmer's Bay Hill Golf Club, Disney's Contemporary Resort, Disney's Wilderness Lodge.